What is Adaptil Calming Collar for Dogs? The Adaptil Calming Collar for Dogs is a calming collar clinically proven to help lessen stressful reactions in puppies and dogs of all ages. It is an easy way to provide up to 4 weeks of continuous comfort to dogs in situations that may cause them stress such as moving, fireworks, thunderstorms, adjusting to new pets or a new baby in the home. When your dog wears the Calming Collar, synthetic pheromones that mimic those naturally emitted by mother dogs are released. These "happy pheromones" will ease your dog's reaction to challenging situations and help reduce excessive pacing, barking and whining. 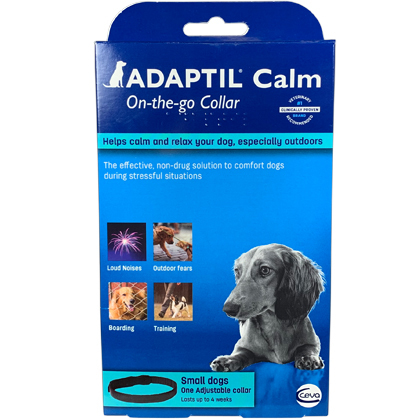 The comforting, reassuring signal released by the Adaptil Calming Collar for Dogs is not a sedative or tranquilizer, and actually helps increase focus during training. NOTE: Adaptil Spray is also available (sold separately) as a convenient way to help comfort dogs while traveling or going to the vet. How does Adaptil Calming Collar for Dogs work? The synthetic canine appeasing pheromone in Adaptil is effective for calming dogs during new experiences and challenging situations. This pheromone is clinically proven to provide reassurance to puppies and dogs of all ages. The Calming Collar will help your dog feel safe and secure during new experiences, unknown environments and other stressful situations. Your dog's own body heat helps release the pheromone in the collar, therefore it must be worn as closely as is comfortable, allowing two fingers' width between the collar and your dog's neck. Keep out of reach of children. Dispose of contents/container to hazardous or special waste collection points, in accordance with local regulation. The Adaptil Calming Collar for Dogs is not recommended for cases of hyperactivity or aggression. There are no known side effects when the collar is used in conjunction with other pet medications. Remove the collar prior to bathing or swimming. Remove the Calming Collar from wrapper. 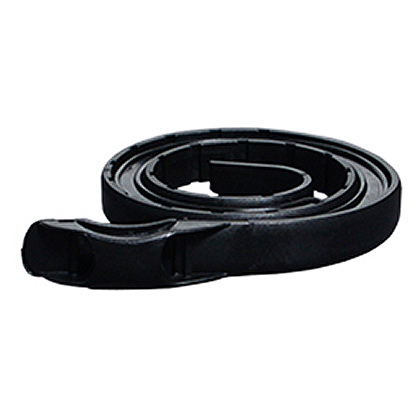 Remove the separation band using pull tab according to the instructions on the package. Buckle the collar around your dog's neck, allowing two fingers of space between the collar and your dog's neck. The Adaptil Calming Collar must be close to your dog's neck to be activated by your dog's body heat. The Adaptil Calming Collar should remain on your dog at all times unless you are bathing or shampooing your dog.